Life often reflects some of the key concepts we systems thinkers discuss around change in complex adaptive systems. Nonetheless, it can sometimes be surprising when you notice them clearly reflected in the more vexing systems problems of your own life. I was thus surprised when I noticed that my post-Ph.D. career trajectory has followed the Panarchy model of cyclic change. This perspective may be helpful in making sense of the transitions and transformations that we all face as our careers unfold. Below, I outline the model, and provide my experiences as an example. My hope is that this can help you to apply the Panarchy model to your own career history, and consider your career future. The Panarchy model describes four major phases of change and development in complex adaptive systems. The initial descriptions of these phases were based on studies of ecosystems, but they are broadly applicable as metaphors in other complex adaptive systems (organismal, social, technological). The four phases are in a loop, so one could, in principle, start anywhere. Traditionally, we start by looking at the r-phase (exploitation and growth) where a new system is just beginning to take root and use available resources to grow quickly. This is like the first seeds sprouting in ground scoured clean after a fire or flood. Next is the K-phase (conservation and stabilization), when the system growth slows as the system becomes more complex, diverse, interdependent, mature, and stable. Picture an old-growth forest, where almost all of the resources are cycled continually between centuries-old trees, undergrowth, and the animals and fungi that eat them and break them down. Typically a K-phase system becomes increasingly resistant to change. Only as systems in the K-phase start to loose resilience, disturbances drive them toward collapse into the Ω-phase (‘omega’: release). The Ω-phase frees up resources that were once bound into K-phase processes and structures, making them available for new systems and functions. This Ω-phase of creative destruction is typically followed by an α-phase (‘alpha’: reorganization), wherein new systems begin to organize from the resources released in the Ω-phase, presaging the transition to the rapid growth r-phase. The K- and r-phases can be seen as the ‘front loop’, when growth and productivity are most obvious, while the α- and Ω-phases are the oft-neglected ‘back loop,’ when most of the activity is hidden below-ground, as old structures are composted, or in small kernels of incipient change. 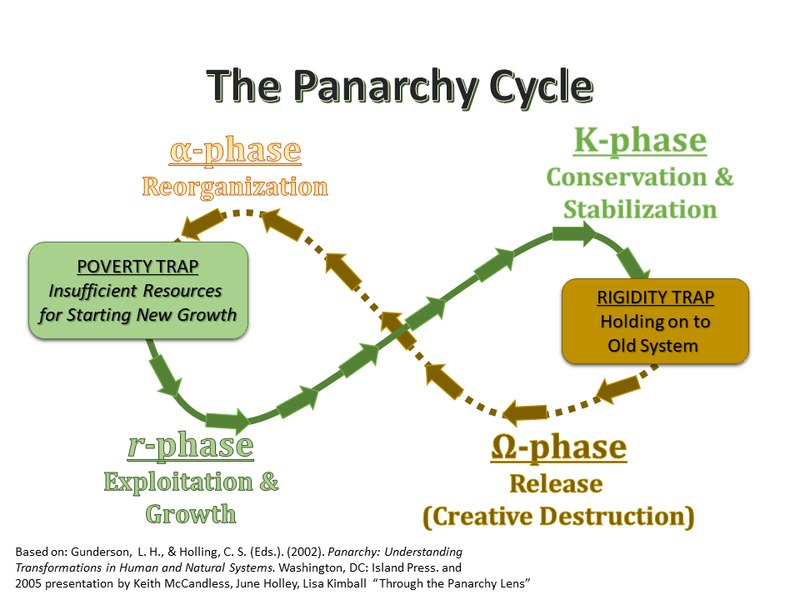 McCandless, Holley and Kimball talked about some of the traps that are often encountered as social systems cycle through these different phases in the Panarchy model. Systems can get stuck in the transition from the α-phase to the r-phase because of a “poverty trap.” There are insufficient resources available to successfully reorganize, there is no fertile ground for the next opportunity to grow and thrive. Systems can also get stuck in a “rigidity trap” between the K-phase and the Ω-phase, when aspects of the old system actively resist change. Resources remain tightly held within old patterns, and novelty is suppressed. I have mapped this Panarchy model onto the cycles of my career path since I completed my doctorate. One could describe the completion of the Ph.D. program as the end of a K-phase followed by an Ω-phase. I knew that I could no longer continue to work on wild primate research, given my field experiences. I felt that the great apes that I so loved and had wanted to study were in too much peril. With my dissertation completed, my time, energy and motivation were available to focus on promoting the kinds of global systems changes that might improve their chances for survival. I wanted to transition to sustainability work, but I was unsure how and where to start. I did a little volunteering, but I could not find a way through that to build a career, given my student debt. I emerged into an α-phase when I was able to begin some consulting work related to sustainability and education, but at first this was not stable and failed to grow. Finally, I added some part-time anthropology teaching at my local community college. This brought me into an r-phase in my career. I was able to teach classes up to the limit for adjunct employment. While I did this, I added in a lot of volunteer work at the college (focused on sustainability), in the hope that I could build a career there as an anthropology instructor and sustainability leader. I held the expectation that my extracurricular efforts at the college would improve my likelihood of being hired full-time, and poured all my resources of time and energy into the institution. In the K-phase of my work at the community college, I developed good relationships with the members of my department and the college administration. I continued to innovate and do research related to teaching and learning for sustainability. I even received an award for my excellence as a teacher. However, budgets were tight, and it was many years until the next full-time position became available in my field. I applied, and I was told I did very well in the interview. Nonetheless, the job was given to someone much younger, from outside the institution. This plunged me into the tumult of an Ω-phase. After some soul-searching, I was able to push through to a new α-phase, concentrating on looking for career opportunities that were better aligned with my true calling: education for sustainability. I moved into my next r-phase with a postdoctoral research fellowship focused on sustainability pedagogy. My knowledge, skills and experiences grew rapidly during this two-year fellowship. As I climbed through the K-phase of that endeavor, I built an international community of practice for sustainability education in Asia, and a broader network of colleagues working on education for sustainability. Because the fellowship in Singapore was limited to two years, I knew I needed to prepare for the next Ω-phase. Throughout the second year of the fellowship I was actively seeking my next job. I got a few interviews, but did not get any offers. To forestall the Ω-phase collapse, I took a pay cut and stayed on with my postdoctoral adviser while he had a small bit of grant funding, but the additional six months of job search I had while doing that work did not bear fruit. The Ω-phase to α-phase transition brought me back to the US. More applications went out, I got more interviews, but still no offers. I completed editing a book and co-authoring a research paper while continuing to search for new opportunities. I have remained this protracted α-phase for over a year now. I find myself now in a poverty trap as I try to emerge into the next r-phase of my career. I know that one of the most useful things I can do in trying to find new work is to go to a professional conference and try to add new contacts to my network. Many months ago, I submitted a proposal to the American Association for Sustainability in Higher Education to give a talk on the work that was the subject of the book I edited: Education and Sustainability: Paradigms, Policies and Practices in Asia. I had expected to have been hired in an academic position by the time I was preparing to go to the conference. That has not happened, and now I find that a year of little-to-no employment has left me unable to afford to go. The experiment I am now attempting is to get crowdfunding to help me out of this particular poverty trap. I set up a campaign on GoFundMe to raise the money necessary to attend the conference. My hope is that there are sufficient social network resources to overcome the lack of financial resources and escape this particular incarnation of the poverty trap. With help, participation in the conference will be a step into the r-phase of (re)building my career. How does your career history map onto the Panarchy cycle? How have you dealt with poverty traps and rigidity traps that you may have faced during transitions?